This is a large file, and downloads can be slow. Gamlingay is an ancient village on the Cambridgeshire/Bedfordshire border, on the B1040 road from Biggleswade to St Ives. The village has a lot to offer its residents, in that we are well supplied with shops, local industry and many clubs and societies covering a large range of interests. The population is about 3500 - with new houses being built every year. Like all villages nowdays we have our share of problems. The roads are getting ever more congested, there is never enough of interest for the youth of the village. It is my hope that most of Gamlingay will be covered by these pages over the next two years. That is, all the clubs, societies, schools etc. If you read this and wish to be included, please contact me, either via Email of by letter. This is a very readable book, not dull history! 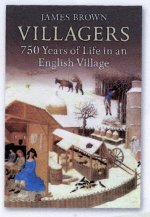 A completley new book by local author James Brown, Villgers tells the story of Gamlingay through 750 years of history and brings the past to life in an extraordinary way. A new book is available "So Great a Cloud of Witnesses"
Over 840 names are listed, from burials, grafitti to donations. Click here for a list of the names. Contact me with any comments.